It’s no secret around these parts that I love auctions. Love them. Love, love, love them. In games, in real life. If I can find a way to maximize the value of a deal, I’m in. So I jumped at the chance to write about auction mechanics. Are you curious about auctions? You should be, because auctions are awesome. And you’ve come to the right place to find out more. What Is the Auction Mechanism? An auction mechanism is just what it sounds like. If you’ve ever been to an auction in real life, or used eBay, or have ever lost out on something you wanted because someone paid more, you’re on your way to understanding the auction mechanism. In board games, the auction mechanism involves some form of player bidding in order to secure certain advantages in the game, whether these are resources, special actions, roles, or abilities, with the advantages going to the player(s) willing to pay the most. 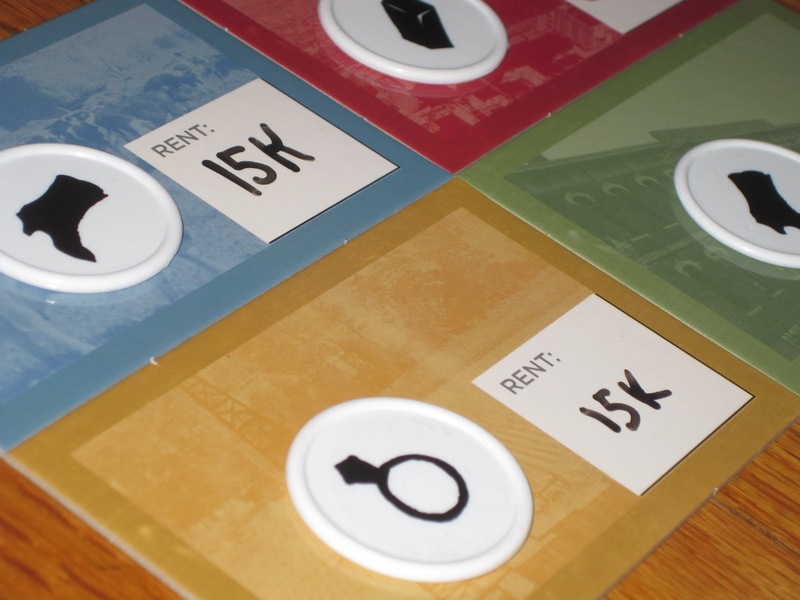 Auctions allow the players in the game to determine the value for game components, which often allows game designers to use more random elements in setting up the game. (Because players determine the value, players are trusted to police themselves and not allow players to underpay for powerful advantages.) Auction mechanics can also go hand-in-hand with negotiation games, though usually informally, as players offer advantages to each other in exchange for other advantages. Why Do So Many Games Use It? Intuitive: While knowing what to value items in an auction is not always intuitive, the auction mechanism itself usually is. Anyone who has been on eBay, or has attended a charity auction, or even has participated in any activity involving supply and demand will have some experience with what they need to do within the game to be competitive for the advantages offered. Interesting decisions: There is very rarely an algorithm that you can use to determine exactly the value of what’s up for auction. Bidding is an art, not a science–or at least not a science that most of us can practice on the fly in the midst of a game. Because of this, auctions usually present players with interesting decisions. What’s it worth for me to bid on this? How much is it worth to Joe? And how much do I not want Jill to have this? Player interaction: Auctions necessarily involve player interaction. Players bid for resources and advantages, and the price is determined by the players in the game. Players can bid one another up just to make the others pay more, or they can bid only on what they have interest in. Either way, players’ decisions necessarily affect other players. Variety/replayability: Auction games are usually high in variety and replayability because they are dependent upon the personalities of the players involved. Also, many auction games use a random system for when goods or advantages are available, which goes a long way toward variety. Even the same advantage, if it appears earlier or later, can have a drastic impact on what players are willing to pay for it. In Ra, for example, an auction track with a flood can mean much more toward the end of a round than the beginning of a round, or a disaster tile ill-timed can destroy the value of an auction track. Excitement: Because auctions bring player interaction front and center, they are exciting. It’s easy to be caught up in the heat of the moment, making exorbitant bids just to keep Jimmy from getting the last piece he needs to complete his puzzle, or to upset someone else’s plans by bidding on the thing they want or by sticking the player bidding up what you want with their worthless purchase. Auction games are exciting and keep players involved. Balance: Auctions, ideally, bring balance to a game (though see “learning curve” under drawbacks). They let players determine the value of advantages and resource in the game, and from game to game, these values can change. Auctions let players police themselves and allow for more random setups (and thus variety) through the changing values and prices. What Are the Drawbacks of Auctions? Learning curve: Auctions serve to balance a game only insofar as players can understand and interpret value. Sometimes it’s hard for new players to determine how valuable a lot up for auction is. Thus, it’s easy for new players to either drastically over- or undervalue what is available for bid. I’ve seen this over and over in games like Modern Art or Power Grid. Despite my warnings that players won’t see returns at their exorbitant bids, they bid high anyway and suffer in-game for it. Or they miss the value of something a more experienced player is bidding on and that player gets it for a song. Sometimes it takes a play or two for players to properly value game components. Dominant personality types: Auctions can sometimes reward assertive personalities, making it harder for soft-spoken players to get involved. A good auction game will usually mitigate this through its rules (and dominant personality types are most noticeable in open auctions). Appeal: Pure auction games can be polarizing because not everyone enjoys value speculation. If a game is a pure auction game, some players (see: Futurewolfie) may be turned off. Forced: In some games, auctions make sense. Modern Art, for example, is a game about buying obscure art pieces, and it mimics real-life bidding in the galleries. It makes less sense in a game like Ra. Why are players in an auction at all? Well, that’s a good question. I’m not one who cares about this criticism (I’m a Euro player, after all), but for some, auctions feel like an artificial addition to force player interaction. Some view it as a way lazy designers balance game components. Modern Art: Modern Art is a grab bag of auction mechanics. The goal of Modern Art is to invest judiciously in paintings by artists. The twist is that players won’t know for sure which paintings are worth anything until the end of the round. This, for me, is one of the more thematic Reiner Knizia games, and it’s also one of the most fun auction games I’ve played. Modern Art uses once-around, open, and blind auctions, as well as a fixed price method of selling. Medici: Medici, with Ra and Modern Art, forms Reiner Knizia’s auction trilogy. 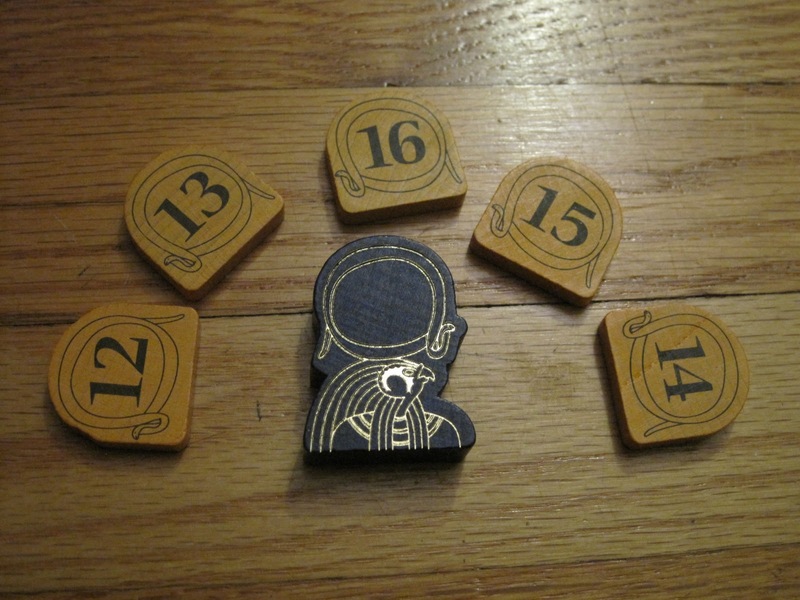 In Medici, players are trying to collect goods in their cargo holds over the course of three rounds. Players score in two ways: by having the most valuable cargo hold overall (this starts fresh every round) and by shipping the most goods of each type (this is cumulative over three rounds). Medici uses the once-around auction mechanism. For Sale: For Sale is a game of house flipping played in two stages. In the first stage, players bid on properties numbered 1-30. In the second stage, players use these properties to bid for checks. For Sale is a very quick auction game that uses orderly and blind auctions. Money: Money is a set collection game all around auctions. Players bid with currency in their hands to collect currency in sets. The scoring is a bit wonky (typical Knizia), but the game is full of interesting twists, not least of which is that the entire game is conducted through blind auctions. Power Grid: In Power Grid, players are vying to power the most cities through acquiring power plants and manipulating resource markets. Power Grid is essentially an economic efficiency game, but players gain power plants through auctions. The power plant auction helps to ensure that the game is balanced since the resource market can vary from game to game. Power Grid uses orderly auctions. Revolution! : In Revolution!, players bid behind their player screens for benefits to use in the round. There are three currencies in the game that follow a hierarchy, and players don’t know who is bidding on what or with what currency. The blind bidding is a big part of this game, but the game itself is played out in how players use the actions they win through bidding. The actions involve various ways to place pieces on the board, and points are awarded to whoever has the most pieces in an area. The Speicherstadt: This game includes one of the most novel auction mechanics I’ve seen. At the start of the round, cards are laid out, and players take turns placing their workers behind the cards they want. The cost of a card is determined by how many workers are behind the card. Placing a worker first ensures that a player will have the first opportunity to buy it, but that player will also have to pay the most money. If that player passes, the next player gets a shot, and so on, reducing the cost of the card. Card acquisition is the main crux of the game, but there are other decisions for players to consider (mostly in cube conversion). 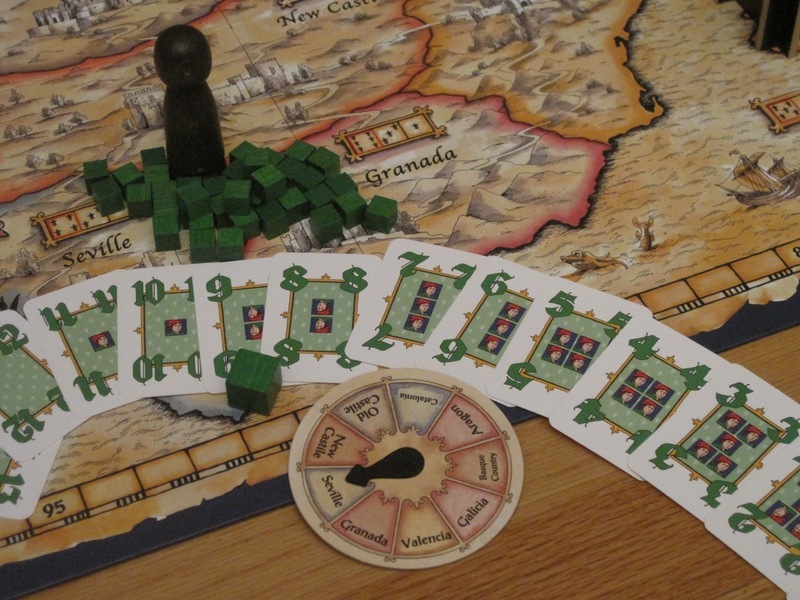 Biblios: Biblios is a short game that involves players giving cards to their fellow players. Each round the start player draws cards one at a time and decides after each card to give the card to himself, his fellow players, or the auction round. Once a player places a card in one of these areas he may not do so again (so he can’t give himself more than one card, for example). The auction in the second phase of the game allows players to ditch cards that have no use for potentially valuable cards. Again, this isn’t comprehensive, but here are some exemplary games that use auction mechanics. What are some of your favorite games that use an auction mechanism? Auctions are not the greatest mechanic for kids; because of the whole over/under value issue and the intangible bluff/deduction meta-game of trying to increase the price of things that you know other players want but you don’t! However, I do recommend one-time around or blind auction elements as the first styles to get kids started in games with this mechanic – and in games where the auction is part of a whole, rather than the sole focus. Well, I enjoyed El Grande, Power Grid, and Speicherstadt, so I guess I oughta try try Revolution! and maybe Biblios. Also, i’m glad Dune made it onto this list. Although I’ve played only the re-implimentation, Rex, I love the auction mechanisms in that game. Orderly bidding in the Dark (not knowing EXACTLY what you’re bidding on)? Blind bidding as a means of Combat resolution? AWESOME STUFF. So I’m not totally against auctioning. Mostly just Ra. I gave you some credit and said that you’re against PURE auction games. Though, yeah, it may just be Ra. Revolution! is fantastic, though it has been hard to get to the table. Maybe I’ll bring it to game night next week. It involves a lot of reading what other people are going to do (as any blind bidding game does), so not everyone enjoys it.